SOLD OVER ASKING - 8 OFFERS - 3 DAYS ON THE MARKET Welcome to The Hayworth Gardens! 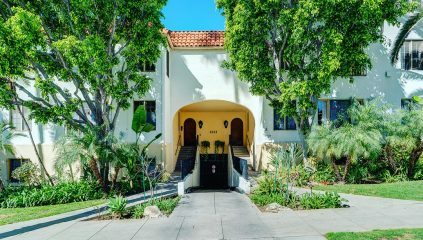 West Hollywood's Premier Iconic Building with original 1920'S Spanish architecture in a lush courtyard setting we all admire. Enter into this pristine sun-drenched Condo on an upper floor via a dramatic foyer with arched doorways. Features include an open cook's kitchen, coved ceilings, Hardwood Floors and large French windows throughout. Generous sized Living Room, Remodeled Kitchen with breakfast bar, granite counter tops, Stainless Steel appliances, gas stove/oven and a Dining Area that all overlook the interior "Melrose Place" lounge courtyard that's great for entertaining, streaming Netflix, sunbathing and texting. 2 Bedrooms and 2 Baths with great closet space and shaded by trees. 2 Assigned gated parking spots, 6 washers, 6 dryers, and a storage locker. Great street for dog walking, easy access to gyms, hiking trails, movie theaters, coffee houses and shops.